What do I do if I Catch a Lynx? Canada lynx are a federally listed Threatened Species. There is no open season for the trapping or hunting of lynx in Maine. Department biologists have confirmed the presence of reproducing lynx in northern Maine. 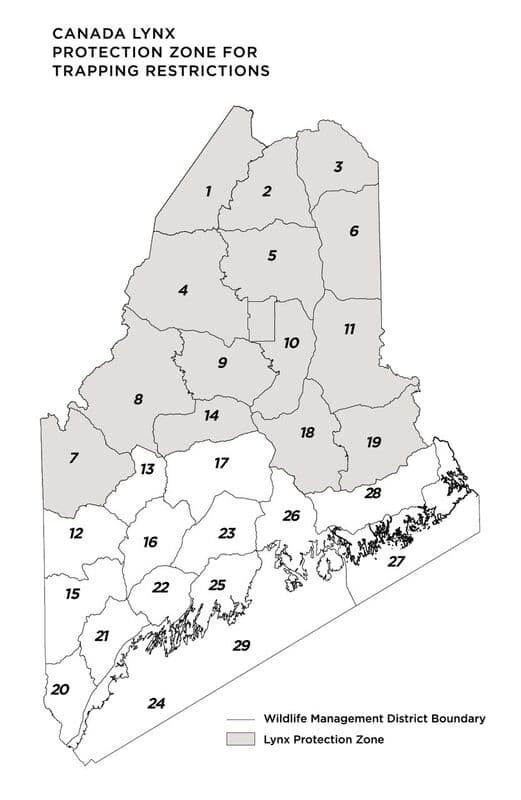 To protect lynx and to help Maine trappers avoid accidentally taking lynx, the Department has delineated a lynx protection zone in northern Maine where special regulations are in effect. Statewide: When set on dry land, trap must have at least three swiveling points (at the base of the trap, midway in the chain, and at the trap's anchoring point). Foothold traps cannot be set above ground or snow level. WMDs 1-11, 14, 18, and 19: When set on dry land, the use of drags is prohibited and the catch circle must be cleared of woody vegetation, debris and man-made material that could cause entanglement of a trapped animal. In WMDs 1-6 and 8-11: No foothold trap may be used that has an inside jaw spread of more than 5⅜ inches unless when set, placed, and tended, the trap is completely underwater. Killer-type (conibear) traps must be set within a lynx exclusion device when set on dry land, except that killer-type traps with an inside jaw spread of 5 inches or less may be set without an exclusion device if the trap is set so as to be partially covered by water at all times, set under an overhanging stream bank, or used at a blind set without the use of bait, lure or visible attractor. For more information on foothold and killer-type traps, see Regulations for Specific Types of Traps. 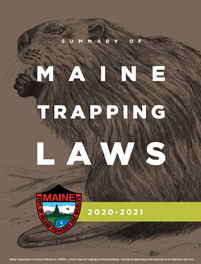 A person who catches a lynx must call the lynx hotline at (207) 592-4734 or a local game warden as soon as possible and prior to removing the animal from the trap, unless a Department official cannot be reached in time to prevent injury to the lynx. Any lynx released under this provision must be reported to the Department within 24 hours from this time it was discovered. The lynx hotline is staffed 24 hours a day, 7 days a week during the trapping season. In most circumstances a biologist will tranquilize, examine, and release the lynx. For more information on lynx biology please contact Jennifer Vashon at (207) 941-4238. If you catch a cat and are uncertain whether it is a bobcat or a lynx, please contact a wildlife biologist or warden immediately. See Know the Difference for a description of lynx and bobcats.